Who is the best photographer in Raleigh NC? If I was bold enough to YELL... DAVID WILLIAMS is the best photographer in Raleigh NC, you'd likely leave the page right now since you are on my website reading this. However, I AM NOT the best "Photographer" generically speaking in the Raleigh market. No photographer can truly master every area of photography to truly be the best at everything. I do feel that I have my strengths when it comes to photography and like the image to the left is stating "Be the best version of YOU." At the end of the day, it's the paying client that truly decides whether my photography is worthy of their money. 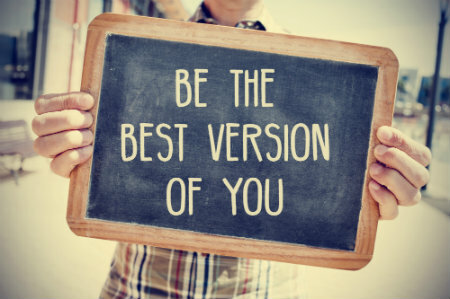 So I strive to be the best version of me that I can be and to work extremely hard for my clients. My goal is to deliver quality photography that exceeds the expectation of my clients. That is something that I honestly feel like a do on a consistent basis. To me, that is the true mark of a professional in any field: CONSISTENCY. If you searched looking for the best photographer or photographers in Raleigh and ended up on this page, please take a few minutes to review my work in the navigation, look at my client list, check out the before and after retouching work and review our team page. After doing all of that, if you feel that you have landed on the right website for your photography needs, please either call me direct at 919.723.8453 or use the online contact form.